Wild adult pair of M. ramirezi, male on left. 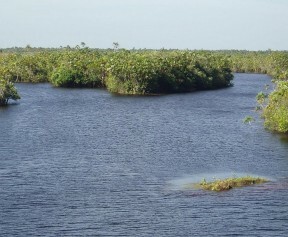 The Caño la Pica is a typical habitat in the llanos of the Río Apure system, Río Orinoco drainage, Venezuela. 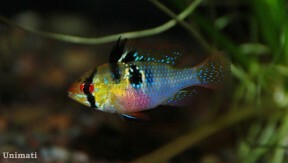 Adult female from the Danish aquarium trade. 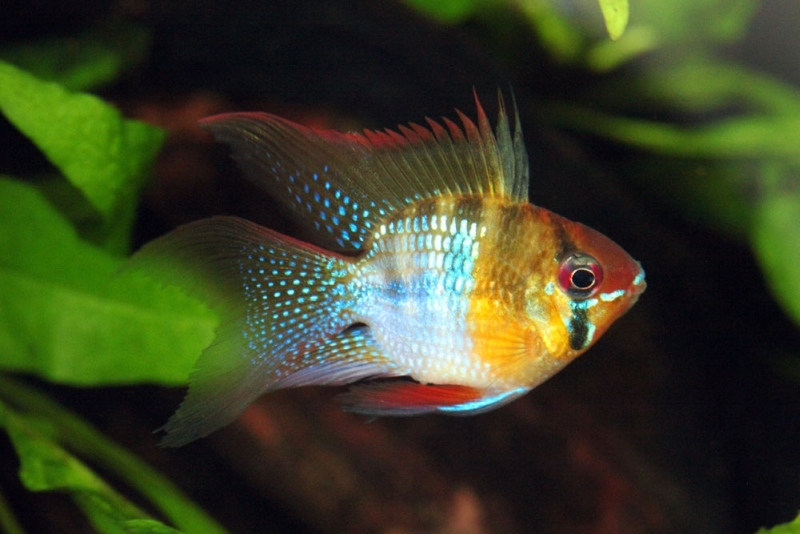 Adult male; 'German blue' ornamental strain. Adult pair in courtship display; female at front, two competing males behind. Adult female apparently collected in the rio Purus drainage, Brazil. Adult male; commercial, and highly-deformed, 'balloon' strain. 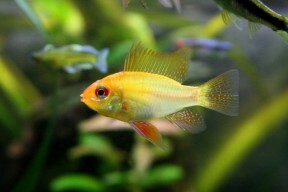 Adult male individual of the popular 'super neon blue gold' commercial strain. 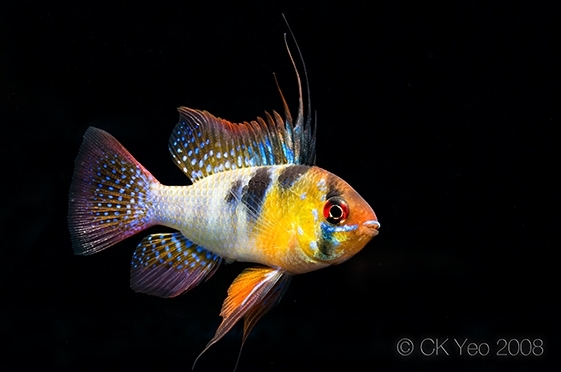 Young adult male; commercial 'long-fin' strain. Typical specimen of the commercial 'gold' strain with odd physical proportions. 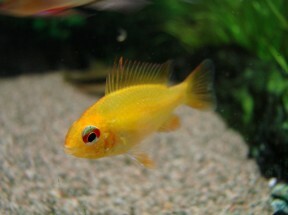 Adult male; commercial 'gold' strain. 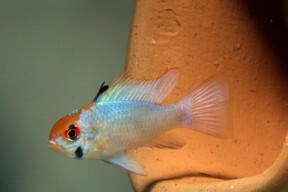 Adult male; commercial 'long-fin' strain. Subadult; commercial 'electric/neon blue' strain. 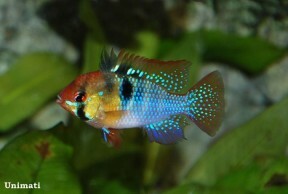 Young adult male; commercial strain. Young specimen; commercial 'gold' strain. Adult pair; commercial strain. Female on left. 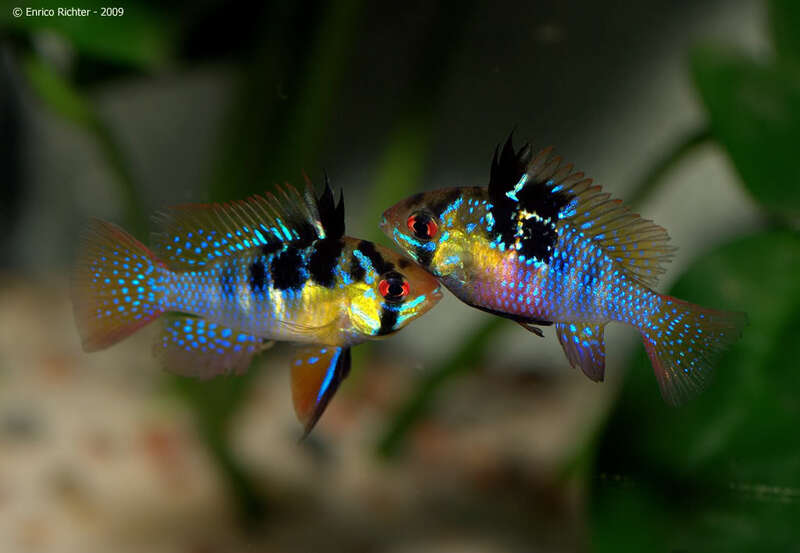 Rival males of the neon/electric blue strain exhibiting territorial behaviour. Young male; commercial 'electric/neon blue' strain. ramirezi: apparently chosen to avoid confusion because the name ‘ramirezi’ was being used for the fish in the ornamental trade prior to its description. The majority of literature suggests that this species is restricted to the Venezuelan and Colombian llanos of the Río Orinoco drainage, although one of the specimens in our images is said to have been collected in the rio Purus, Brazil, an Amazon tributary located some distance from that watershed. Type locality is ‘Orinoco system, Venezuela’. The Llanos is a vast, highly biodiverse system of tropical savannah grasslands, seasonally-flooded plains and forests covering an area measuring almost 600,000 square kilometers in Venezuela and Colombia. There are well-defined annual weather patterns with distinct wet and dry seasons and year-round high temperatures. It is located to the north and west of the Río Orinoco and drained by many of the river’s tributaries. Other fishes occurring in the region and available in the aquarium trade include Corydoras delphax, Platydoras costatus, Baryancistrus beggini, Hypancistrus inspector, Panqolus maccus, Panaque nigrolineatus, Hemigrammus rhodostomus, H. stictus, Hyphessobrycon sweglesi, Paracheirodon axelrodi, Pristella maxillaris, Copella nattereri, Biotodoma wavrini, Geophagus abalios, Heros severus, Mesonauta insignis, Satanoperca daemon and Uaru fernandezyepezi. An aquarium with a base measuring 60 ∗ 30 cm or equivalent is sufficient for a single pair. The addition of dried leaf litter would further emphasise the natural feel and with it bring the growth of beneficial microbe colonies as decomposition occurs. These can provide a valuable secondary food source for fry, while the tannins and other chemicals released by the decaying leaves aid in the simulation of natural conditions. Filtration, or at least water flow, should not be very strong and very large water changes are best avoided with regular changes of 10-15% recommended. In the aquarium they should be offered a variety of live and frozen fare such as bloodworm, Artemia, Daphnia, grindal worm, etc., supplemented by good quality, sinking dried foods of a suitably small size. 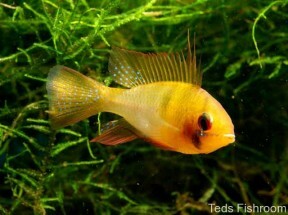 Wild fish may initially refuse the latter but normally learn to accept them over time. 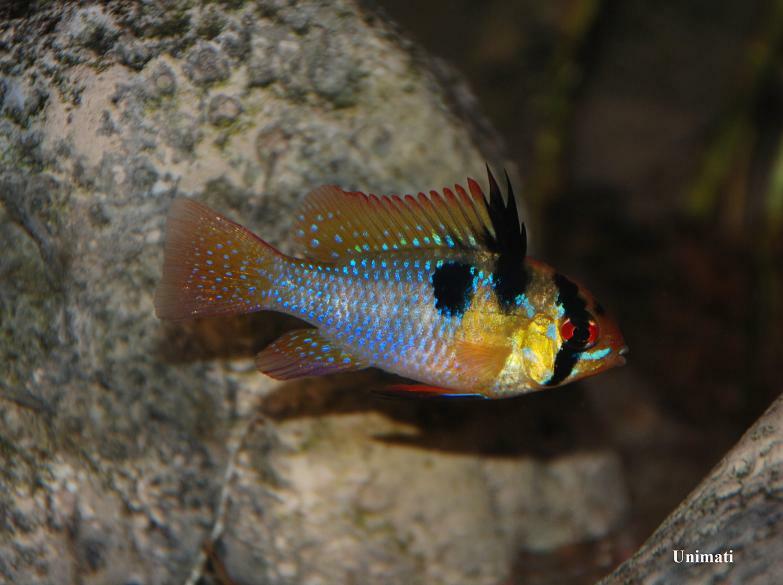 Despite normally being sold as such M. ramirezi is not recommended for the general community aquarium since it requires pristine water quality and is a poor competitor, although that is not to say it must be maintained alone. Groups of peaceful, open water-dwelling characids or similar are particularly recommended tankmates, since the presence of small schooling or shoaling fishes appears to be used as an indicator that there is no immediate threat in the vicinity and therefore can help reduce shyness. 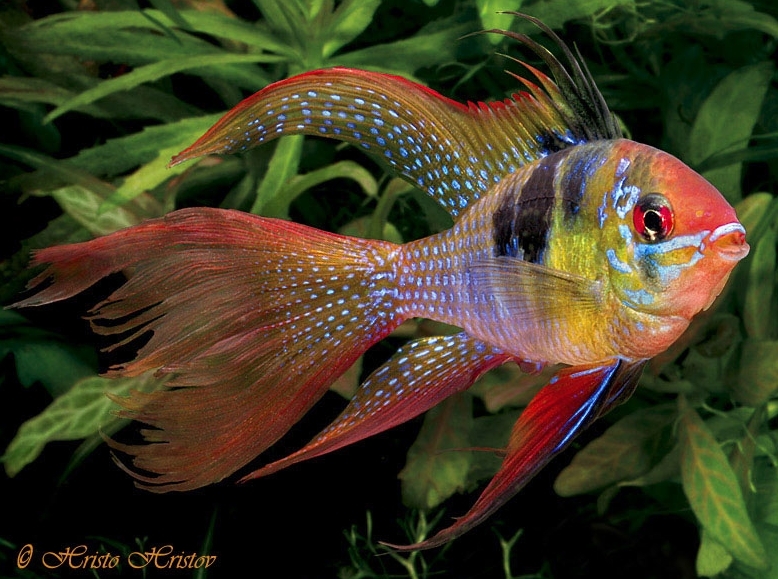 Adult males grow larger than females, possess slightly more-extended fins, and are more intensely-coloured. Most females possess a pinkish patch on the belly which is absent in males, although this may not be the case in some ornamental strains (see ‘Notes’). There does not appear to be any particular trigger for the spawning process with the main requirements being good diet and stringent maintenance regime. The eggs can be tricky to raise and easily develop fungus or fail to develop unless the water is very clean and of low hardness, however. 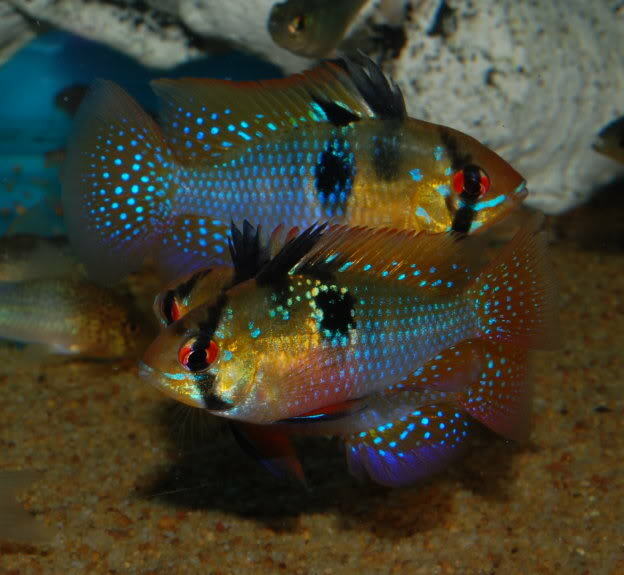 Inexperienced pairs may eat their brood but often get things right after a few attempts whereas the commercially-produced fish (see ‘Notes’) tend to be of relatively poor quality and may fail to fertilise many of their eggs or simply consume them repeatedly. Unless sexable adults are available it is best to begin with a group of young fish and allow pairs to form naturally, separating them as they do so, and we recommend purchasing these from a reputable private breeder if possible. If maintaining the adults in a community situation it is recommended to remove either tankmates or eggs at this point should you wish to raise good numbers of fry. Both male and female participate equally in brood care. Incubation is 2-3 days after which the fry remain largely immobile for a further 5 days during which period they do not require any supplementary food. Once free-swimming they should be offered microworm, infusorian and other microscopic foods for the first 2-3 days after which larger foods such as Artemia nauplii can be introduced. 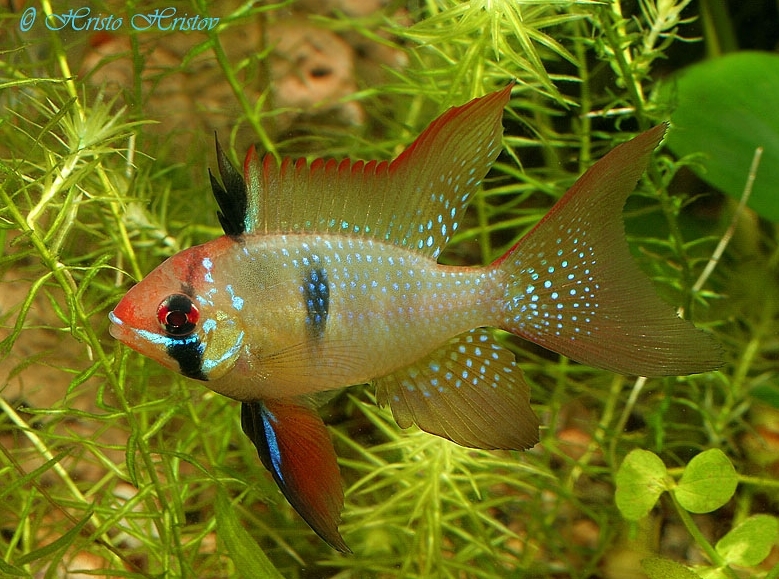 M. ramirezi is also known by the names ‘Ramirez’ dwarf cichlid’ and ‘butterfly cichlid’ and is among the more popular dwarf cichlids in the aquarium hobby. 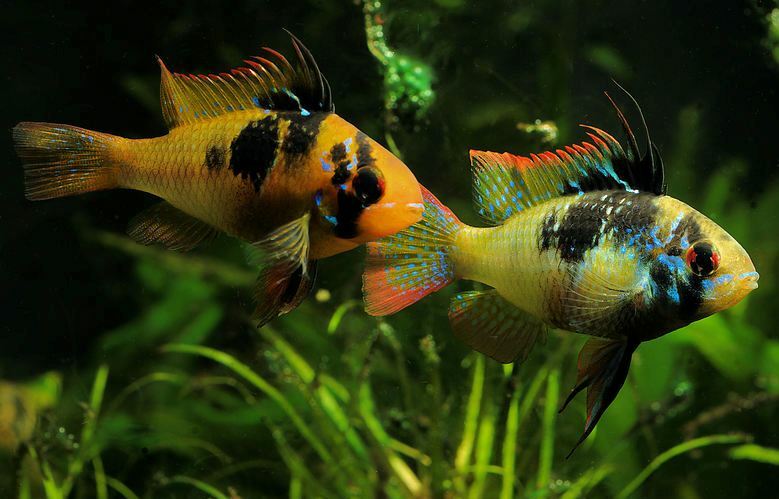 As a result, it is produced on a commercial basis in huge numbers and a number of ornamental strains have been developed including ‘gold’, ‘long-finned’ (both blue and gold forms; also traded as ‘lyre-tail’, ‘veil-tail’ and ‘hi-fin’), ‘electric/neon blue’, ‘super neon blue gold’ ‘pearl/perlmutt’ and ‘balloon’. These artificially-reared forms, in particular the latter, tend to be genetically weak, susceptible to disease, exhibit shortened life-spans and poor reproductive vigour, plus in many cases only males are distributed. 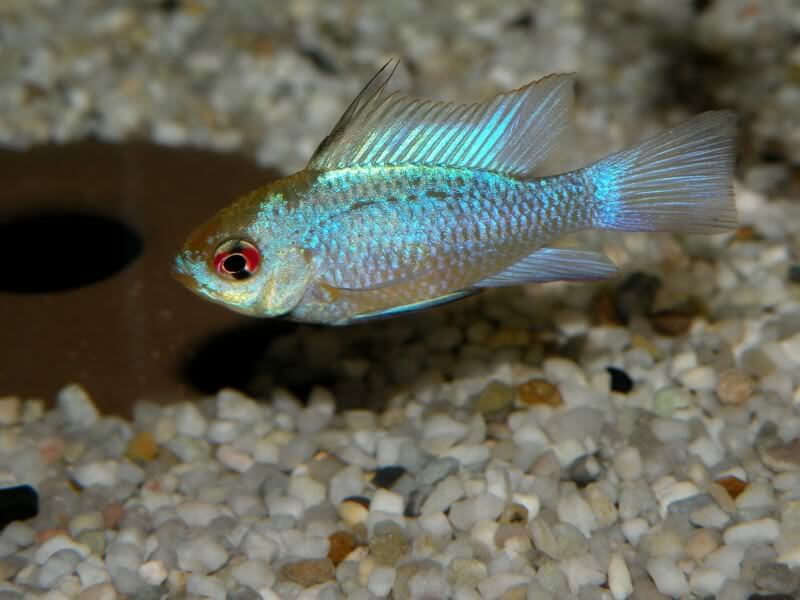 It is thought that hormones may be used to boost production and the fish are usually raised on dried food products containing high quantities of protein and carotenoid pigments to accelerate growth and intensify colouration. The classic ‘German Blue’ form, previously considered of good quality, is also now produced in a number of different countries and has suffered as a result. 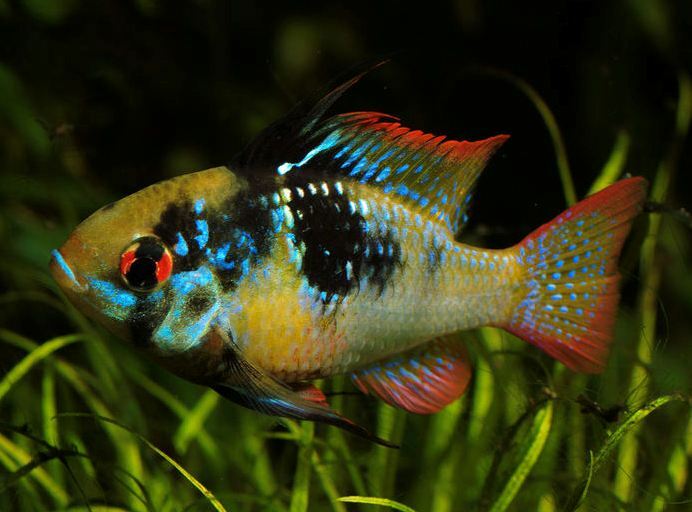 While undoubtedly of superior genetic stock wild fish are more demanding in terms of water conditions and diet and arguably suitable only for experienced aquarists, therefore it is difficult to recommend this species unless a reputable private breeder can be found. The genus Mikrogeophagus currently contains just two recognised species. They are separated from one another in a geographical sense with M. ramirezi occurring in Venezuela and Colombia and its congener M. altispinosa native to Bolivia and western Brazil. 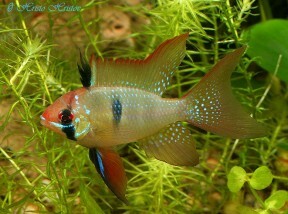 The latter is also a larger, less-colourful fish lacking blue iridescent markings on the fins, body and head. 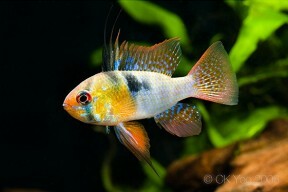 The Ramirezi dwarf cichlid identified. 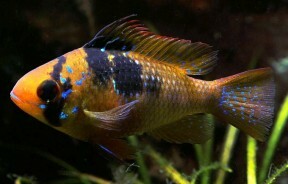 [Apistogramma ramirezi is attributed to Myers & Harry in this work. The author is anonymous (probably W. T. Innes). A more complete description appeared later in Myers & Harry 1948. Colour Enhancement in the Ornamental Dwarf Cichlid Mikrogeophagus ramirezi by Addition of Plant Carotenoids to the Fish Diet. 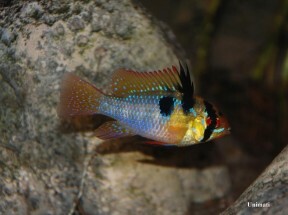 Apistogramma ramirezi, a cichlid fish from Venezuela. 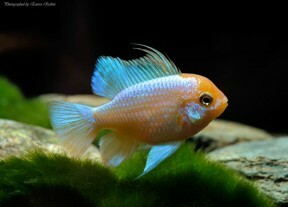 My favorite fish 🙂 thanks for all the very detailed info! I bought a couple of them like a month ago. They are still little, and apparently a male and a female. Notwithstanding, their colors are still very pallid and poor. I fed them with Tetra Color, but still they are very “feeble”, nonetheless they seem to be healthy. What is happening? Can you help me? Make sure that the water is soft and acidic enough. The lower you go, the better they are. Feed them with frozen food: artemia, glassworm, daphnia, moina. Use flakes only once, or twice a week. They are a suplement that will add vitamins to the diet. If You want to see them fully colored, it’s imperative that You use sand on the bottom of the aquarium. 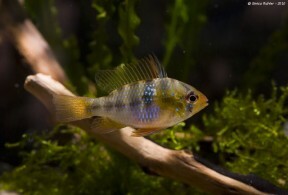 Sifting sand is the basic of dwarf cichlids hygene. Be sure not to stain water too much. They are not a black-water species, and prefer nice, covering vegetation. Also I strongly encourage You to see Ivan Mikoljis video: “Natural aquarium”, which is about fish from Venezuela. 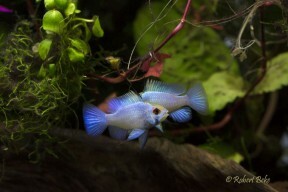 Also add dried leaf litter to the bottom of the tank, as it will enchance the diet with plant matter.